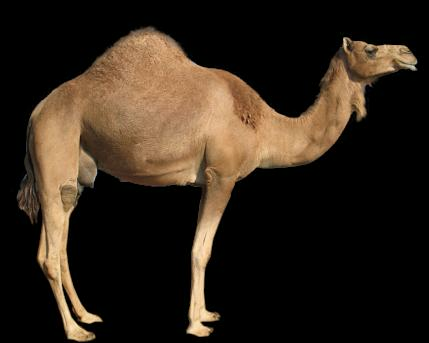 The camel is symbolic of a vehicle of a tough nature. It is also symbolic of a specific ministry or business, strength, or a long journey. It also signifies a servant’s heart. The raiment worn by John the Baptist was made of camel's hair (Matthew 3:4; Mark 1:6), by which he was distinguished from those who resided in royal palaces and wore soft raiment. To show the difficulty in the way of a rich man's entering into the kingdom, our Lord uses the proverbial expression that it was easier for a camel to go through the eye of a needle ( Matthew 19:24 ). To strain at (rather, out) a gnat and swallow a camel was also a proverbial expression (Matthew 23:24), used with reference to those who were careful to avoid small faults, and yet did not hesitate to commit the greatest sins. The Jews carefully filtered their wine before drinking it, for fear of swallowing along with it some insect forbidden in the law as unclean, and yet they omitted openly the "weightier matters" of the law. So negatively then, it is symbolic of a holding things in, ungraceful, unclean and a large burden.